The France food experience started very well, with a late breakfast in Vernon. It was Saturday morning and we stumbled by chance on a big food market. 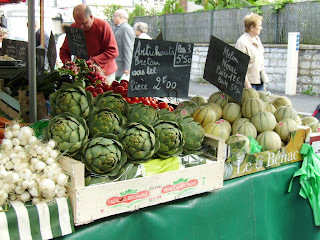 Check out these artichokes - what’s in the soil over there? We went to the butcher, the baker and the cheesemaker, and using my bestest French collected a long baguette, some local soft cheese, and some €17 a kilo ham. In truly gorgeous European summer sunshine, we sat by the river and toasted the start of our four day trip through Picardie, Normandy and Flanders. We spent three nights in Amiens, a very pleasant city, and on our first morning found a wonderful cafe, which set a precendent for petit dejeuner that we didn’t match again. 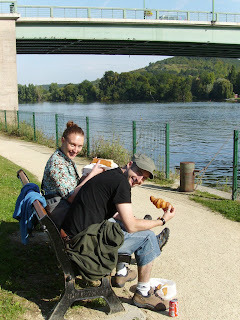 For €6.50 we leisurely made our way through cafe au lait (or a stand-your-spoon-up thick chocolate chaud), croissant, pain viennoise (baguette), jam, butter and an orange juice. With a breakfast like that we were ready to face the day of driving, hopelessly lost, through the idyllic French countryside. We always got to where we wanted to be eventually. Our most significant evening meal in Amiens was taken at A la Capitainerie in St Leu (the website has some nice pictures of the area). They had a menu that had been ambitiously translated, and I felt I had to order their terrine de lapin, which they had intriguingly translated as ‘pot of rabbit in its jam of onions’. 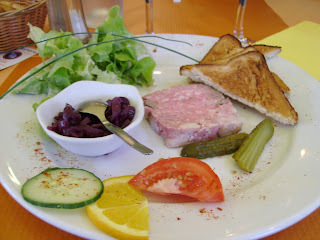 It was good terrine, and the onions were wonderfully caramelised. I had moules mariniere for main, which was both less intriguing and less well executed. It’s not French, rather Austrian, but my drink recommendation from the France section of the trip is Edelweiß beer, a very refreshing, citrussy weizbier. We tried it in a pub in the Saint Leu area of Amiens, where they were also playing the very highest quality 80s film clips. Very, very good entertainment. If you’ve seen ‘Music and Lyrics’, the film clip Hugh Grant does in that had nothing on these.